Trills from the throstle's wild summer-sung tune. Winter is one of the four seasons of temperate zones. It is the season with the coldest days and the lowest temperatures. 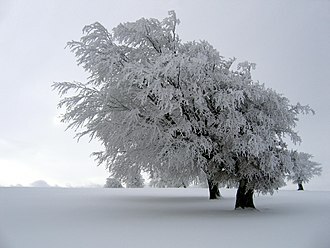 In areas further away from the equator, winter is often marked by cold weather; it is associated with snow, frozen water, and limited daylight. William Cowper, The Task (1785), Book IV, line 120. Do not want to go out in fridge-crossed-with-swimming pool-like world. Helen Fielding, Bridget Jones' diary, Monday 27 January. Included in 'The Edge of Reason' (1999). Never tell me of the sterner beauties of winter. Winter may have a mighty beauty of its own, where the mountain rises, white with the snow of a thousand years, hemmed in by black pine forests, eternal in their gloom ; where the overhanging avalanche makes terrible even the slightest sound of the human voice ; and where waters that never flowed spread the glittering valleys with the frost-work of the measureless past. But the characteristic of English scenery is loveliness. We look for the verdant green of her fields, for the colours of her wild and garden flowers, for daisies universal as hope, and for the cheerful hedges, so various in leaf and bud. Winter comes to us with gray mists and drizzling rains : now and then, for a day, the frost creates its own fragile and fairy world of gossamer ; but not often. We see the desolate trees, bleak and bare ; the dreary meadows, the withered gardens, and close door and window, to exclude the fog and the east wind. William Shakespeare, As You Like It (c.1599-1600), Act II, scene 1, line 5. William Shakespeare, King Lear (1608), Act II, scene 4, line 46. William Shakespeare, Love's Labour's Lost (c. 1595-6), Act V, scene 2, line 922. That scarce his loosed limbes he hable was to weld. Edmund Spenser, The Faerie Queene (1589-96), Canto VII. Legend of Constancie, Stanza 31. Robert Louis Stevenson, In Winter I get up at Night. Vapors, and Clouds, and Storms. James Thomson, The Seasons, Winter (1726), line 1. James Thomson, The Seasons, Winter (1726), line 229. And reigns, tremendous, o'er the conquer'd Year. James Thomson, The Seasons, Winter (1726), line 1,024. Quotes reported in Hoyt's New Cyclopedia Of Practical Quotations (1922), p. 877-78. Robert Bloomfield, The Farmer's Boy, Winter, Stanza 2. William Cullen Bryant, A Winter Piece, line 66. Samuel Taylor Coleridge, Frost at Midnight, line 1. Downy and soft and warm. Flaky and soft, from his wide wings of snow. Fanny Kemble, Winter, line 9. Charles Kingsley, Saint's Tragedy, Act III, scene 1. Alexander Pope, Ode to Winter, line 85. Christina G. Rossetti, Spring signals to Winter. Harriet Prescott Spofford, Under the Snowdrifts. On our hearth shall glow. John Greenleaf Whittier, Lumbermen, Stanza 8. John Greenleaf Whittier, The Pageant, Stanza 8. William Wordsworth, On the Power of Sound, Stanza 12. This page was last edited on 20 January 2019, at 14:11.